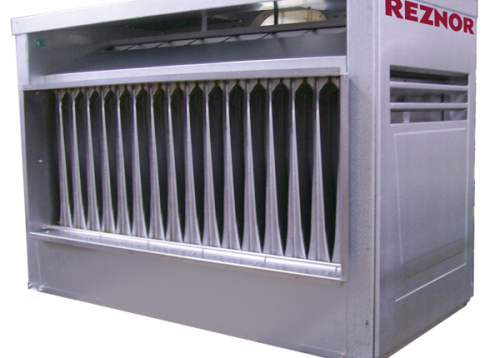 Reznor X Series Duct Furnaces are designed to provide 80% thermal efficiency for indoor application with gravity venting. They are certified for use with natural or propane gas, as specified, in sizes from 75,000 through 400,000 BTUH input. These models are used as heating components in heating, heating/cooling, or makeup air systems and require a separate blower system for air delivery. 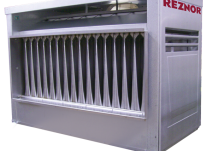 The furnace has a Reznor Thermocore® aluminized steel heat exchanger with venturi-design tubes. The die-formed burners are of aluminized steel and include flared ports with a stainless steel insert. The Model X furnace is approved for a temperature rise of 50°F to 90°F and includes “finger-baffles” for proper air distribution at these lower air volumes. Removing the finger-baffles increases the air flow. These field converted units are approved for a temperature rise of 20°F to 75°F. Standard features include a spark ignition pilot and a single-stage, 24-volt gas valve. Model X units are wired for field connection to a remote 24-volt thermostat for automatic operation. Each unit is provided with all required limit and safety controls, including a blocked vent shut-off system. 1. Regulated combination redundant gas valve consists of combination pilot solenoid valve, electric gas valve, pilot filter, pressure regulator, pilot shut-off, and manual shut-off, all in one body. Gas supply pressure must not exceed 0.5 PSI (8 oz. – 14” w.c.). Minimum inlet pressure for natural gas is 5” w.c. Minimum inlet pressure for propane gas is 11” w.c.
2. For air inlet temperatures below 40°F or temperature rise less than 40°F, an optional stainless steel heat exchanger is recommended. 3. See temperature rise and pressure drop tables. 4. Blower must be placed on entering side of furnace. 5. Approved for installation downstream of an air conditioning coil (optional drain flange, stainless steel heat exchanger, and stainless steel burners are recommended). 6. Not approved for residential use.